Have you ever wondered why God has entrusted you with resources? 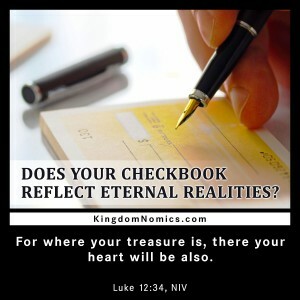 KingdomNomics is living life by the principles defining value from God’s point of view, as outlined in the Scriptures. We apply these principles in the decisions that determine how we invest our time, our talent, and our treasure, the “three Ts” of kingdom advancement. KingdomNomics is using what is temporal and leveraging it for eternity. We all have time, talent, and treasure, and these are being consumed daily. The question is, by what? Are they being consumed for the sake of temporary pursuits, or toward things that are eternal? For those who take seriously the coming of a new life—one that follows earthly life—nothing could be more important. And yet so many of us live as if these decisions are trivial, expending those three Ts with little thought of the fact that what we do here echoes in eternity. Let’s begin by breaking down your life to the lowest common denominators. We’ll start with God—the one who made you. Then there is you. Then there are your resources—everything you can use or interact with in this world, including the 3Ts: time, talent, and treasure. So we have three entities. And we can think about each one of these entities as being a circle. The questions are: How do they relate to one another? Do they overlap, or does each one stand alone? And if they overlap, which circle takes precedence? How do you relate them to one another? You relate to God and to your resources, but do those circles relate to each other? Do you approach your resources based on your beliefs about God? Or do you approach God based on your resource needs? Or do those two circles never even intersect, having nothing to do with each other? Jesus said that one of these “circles” will actually become the master of the other—you will serve God or money. It’s clear, then, that how you relate to these questions will make a far-reaching statement about who you are, how you live, and who you are becoming. Then he discovers something truly thrilling: worldly wealth comes and goes, but he, acting on kingdom principles, can become rich in the world to come by making the right investments in this one. He can take it with him—if it’s the right “it.” That means focusing on what matters to God. In the end, of course, what matters most is that God speaks to you and shows you that your life will be invested, one way or another. It all comes down to your time, your talents, and your treasure, and where you use them. These are the most important decisions you’ll make. Will you be consumed by the temporary and unsatisfying things of this world, or with the passion of living for Christ? The free KingdomNomics book provides an overview of biblical principles that show you how to lay up treasure in Heaven—treasure that will be enjoyed for eternity. Through the free KingdomNomics Applied devotions, you will discover principles that can help you become a wise steward of your time, talent, and treasure.